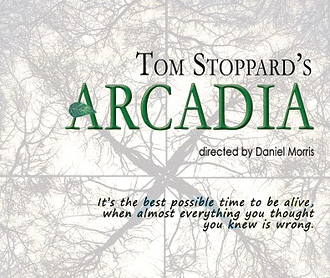 Bad Habit Productions will kick off its fifth season with Tom Stoppard's "Arcadia." Artistic Director Daniel Morris will direct the production, set to play the Wimberly Theatre in the Calderwood Pavilion at the Boston Center for the Arts from August 11 - 18. Tom Stoppard's "Arcadia" examines the universe's influence in our lives, blurring the edges between past and present, science and art, order and disorder, and the certainty of knowledge. Set in an English country house in both the early 1800s and the present day, the play concerns the discoveries of two modern scholars, and the fates of those who lived in the estate and its gardens more than 200 years earlier. The company features: Alycia Sacco, Greg Nussen, John Geoffrion, Sarah Bedard, Arthur Waldstein, Nora Long , Luke Murtha, David Lutheran, Rebbekah Vega Romero, Nick Chris, Glen Moore, and Chris Larson. "Arcadia" premiered in 1993 at the Royal National Theatre in London. The production won the prestigious Olivier Award as Best New Play of the season. A critically-acclaimed New York production followed in 1995. The most recent Broadway production was mounted this past March and was nominated for a Tony Award as Best Revival of a Play. At the Wimberly, innovative theatre-in-the-round staging will bring the audience very close to the action, adding to the experience. Talk back sessions with the company will be conducted following the 2 p.m. performances on August 14 and 21. As well, the 7:30 performance on August 18 has been designated "Pay What You Can."